Loop location to be announced at 1PM sharp TODAY, Wednesday, 2/13. 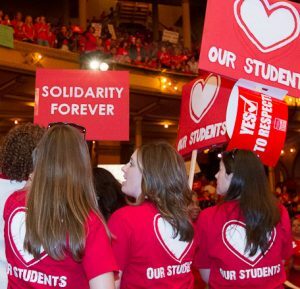 Management recycles same tired ‘offer’ to trade raises for cuts to student service, as strikers prepare to risk arrest to force agreement that preserves student services. 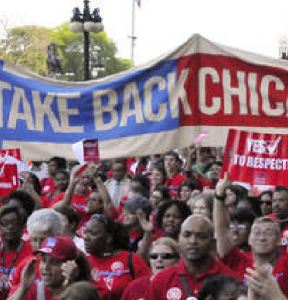 CHICAGO—CICS leadership returned to the bargaining table with striking CTU teachers and paraprofessionals Tuesday—and recycled the same tired demand that low-wage educators receive raises only if they also agreed to increased class sizes with no enforcement guarantees, cuts to counselors and social workers, and gutted family leave for low-wage paraprofessionals. Strikers trained for civil disobedience on Tuesday—and will put that training into action TODAY, Wednesday, Feb. 13 at 1PM at a loop location targeting CICS leadership, in an effort to force CICS bosses to release some of the tens of millions of dollars they’ve robbed from students and classrooms in the last three years. The location of that 1PM civil disobedience will be announced at 1PM SHARP today by email. CICS is hoarding $36 million in public dollars, and refuses to release the fraction of those funds it would take to settle the strike. On Tuesday, educators filed a formal complaint with the Illinois Attorney General’s Office, along with a report on CICS insider dealing, board meeting minutes that validate the information in the complaint, and a copy of the CICS agreement with its co-founder and former board president, who is estimated to have pocketed hundreds of thousands of dollars from the deal. Strikers are calling for an investigation into CICS’ finances, which are riddled with insider deals, cash hoarding, exploding corporate management positions and outrageous management fees to their subsidiary management operations that siphon off up to 30% of the public dollars that CICS receives to educate children. CICS has jacked up management fees 25% this year alone for its various shell corporations, costing classrooms an additional $1.2 million in educational funds that could settle the strike. CICS has offered an 8% average raise in the first year of a new contract, not the 31% management continues to falsely claim. The proposal would leave wages well under CPS compensation levels for the entire four year agreement. The strikers are asking for equal pay with their CPS peers.